Shimano's 11-speed XT CS-M8000 features the Rhythm Step gear progression that made its debut on Shimano's top-of-the-line XTR groupset. With these close-step gear ratios calculated in conjunction with Shimano's 11-speed XT cranksets, you'll find smooth transitions from gear-to-gear that keep you climbing and charging without a hitch. The largest cog and spider are made from aluminum to maintain a low weight while the rest of the cogs are made from steel for the strength and durability that Deore XT is known for. Compatible with Shimano / SRAM 9/10/11-speed freehubs. Will not work with XD drivers. Approximate weight is 440 g (11-42T). Note: 11-46 cassettes are compatible with 1x drivetrains only. 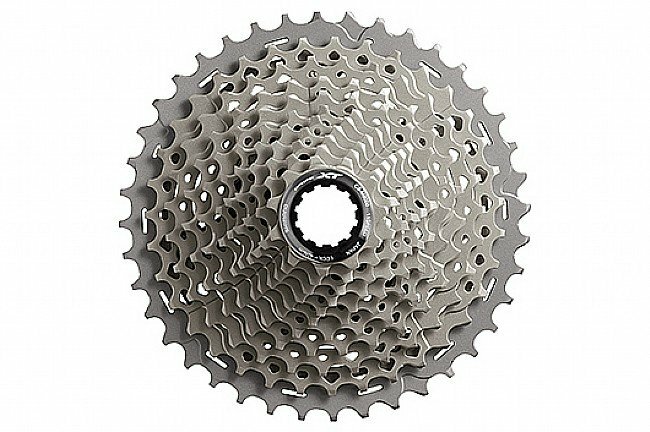 If switching from a smaller range cassette, a new chain will likely be required in order to accommodate the larger 46T cog. Compatible replacements include the Shimano XT HG701 Chain and the XTR HG901 Chain.